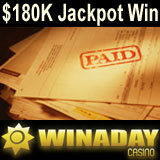 WinADayCasino.com jackpot winner Joe H. says he’ll use some of his $184,060 jackpot win to pay off some bills. He’s also thrilled to be able to help his grandchildren with their education. But the self-employed grandfather said he also plans to set plenty aside to enjoy playing casino games and to do some Christmas shopping. The winner was playing the new Pyramid Plunder slot machine on Monday when he spun the winning combination. Fortunately he had at least $5 wagered on that lucky spin. Although the WinADay jackpot was hit for a record-breaking $225K in June, the average win is about $160,000 making the latest win one of the largest this year. All but one of WinADay’s slots games are tied to one progressive jackpot but this is the first time it’s been won on Pyramid Plunder. Pyramid Plunder has been one of Joe’s favorite games since the instant casino it launched last November. It’s a 25 pay line slot machine with three opportunities to win bonuses: an animated Scarab beetle that gives a second chance for a winning combination; a Mummy that shifts its reel down by one or two symbols to create additional winning combinations; and the Chamber of Treasures bonus game where players can win cash and free spins. WinADayCasino.com is a no download casino with 27 one-of-a-kind slot games and video poker games. Its progressive jackpot was reset to $50,000 following last week’s win. At its sister site, Slotland.com, the jackpot is currently over $160,000. WinADay players interact with each other and receive special casino bonuses on Facebook: www.Facebook.com/WinADayCasino.